It’s hard to imagine the revelation — and the timing of it — won’t hurt Elizabeth Warren’s odds of winning the 2020 Democratic nomination. But the U.S. senator from Massachusetts told the Boston Herald today that she still plans to jump into the presidential race on Saturday and seek the Democratic nomination despite a document from earlier this week revealed that she claimed to have Native American heritage in the past. 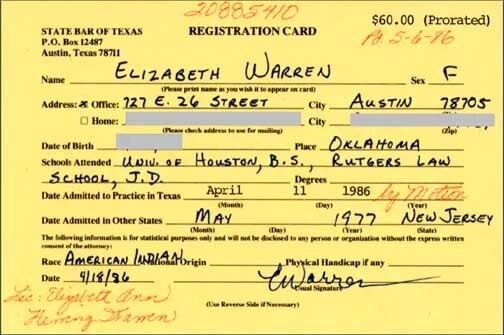 On Tuesday, just days before Sen. Warren had planned to formally announce her presidential run, documents showed that she listed her race as “American Indian” on a State Bar of Texas registration card from 1986, the Washington Post reported. Sen. Warren repeatedly apologized on Wednesday for claiming Native American heritage and listing herself as such on the 33-year-old document. During her apology, Sen. Warren, who’s originally from Oklahoma, said she grew up believing she had Native American ancestry based on what her family members told her. She also added that there may be other forms or documents where she claimed to be “American Indian.” However, she reiterated that she never used her Native ancestry claim to advance her career. A reporter then asked Sen. Warren if she would be dropping out of the presidential race — a campaign she had planned to launch this weekend — but she did not give a response at the time. Before the reports surfaced, Bovada had listed Warren at +1800, placing her fifth among the candidates most likely to win the 2020 president election — only President Trump (+220), Kamala Harris (+500), Beto O’Rourke (+900), and Joe Biden (+1000) had a higher chance of winning. Currently, the 2020 presidential odds are not posted, likely due to oddsmakers wanting to access the situation before allowing any more action. We will follow up on the story and provide updates as soon as new odds are released. Sen. Warren is scheduled to formally announce her run for President of the United States on Saturday, Feb. 9. at 11 a.m. at Everett Mills on Union Street in Lawrence, Massachusetts. After her announcement in Massachusetts, Sen. Warren will travel to Iowa, New Hampshire, South Carolina, Georgia, Nevada, and California to begin campaigning and get a jump on the growing Democratic field of possible 2020 presidential contenders.